November 2018 Class To Go is here. 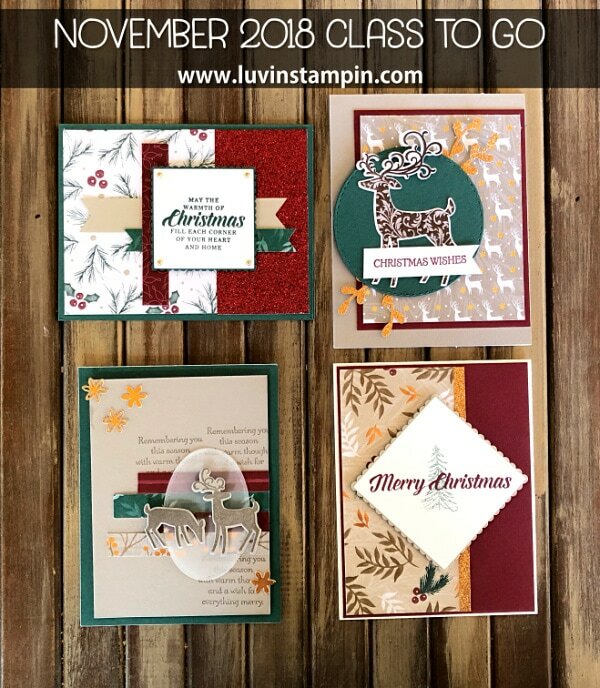 I have 4 beautiful Christmas cards to share with you! If you are new here, my class to go’s are super fun. I provide exclusive videos, card kits, and a PDF reference guide. + Video link will arrive in your email when you complete your PayPal transaction. + Video for each card/project will be included in the email that you receive after you place your order. Save that email. Here is the supply list for the cards I created. You can purchase any of these products on their own. But it makes sense to get the Class To Go get it all if you want the stamp sets and framelits. It will save you money.